Utility as a title for this work is not only an acknowledgment of its placement on city utility boxes but underscores the historic doctrine of classical utilitarianism, one of the most powerful sources of the tradition of free speech: that virtue is based on utility and that society should maximize the utility of the individual to create "the greatest happiness for the greatest number of people.” This principle of utility as the standard of right action on the part of governments and individuals includes freedom of expression—freedom of speech, of the press, of association, of assembly and petition—all protected by the First Amendment. However, this constitutional right does not go unchallenged or coopted with more nefarious intentions, as we have experienced to a huge extent in recent times. 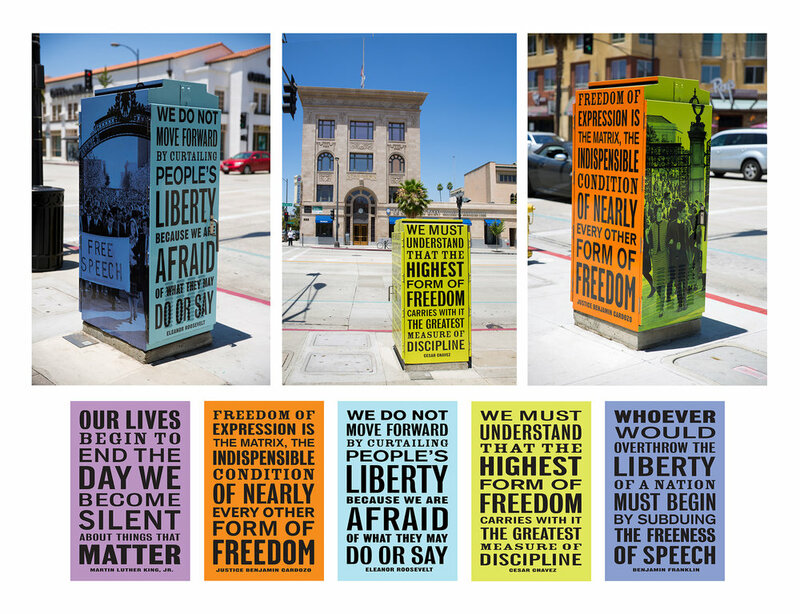 Silton selected the image and texts for the community of Pasadena as a way of highlighting the Playhouse District as a centerpiece for culture, and the role that freedom of speech plays within culture. Free speech in the form of image and text is a direct and emblematic way to link the mission of the Playhouse theaters to the importance of our national right to provide a voice to everyone. Utility is a call to action to recognize and utilize this right in all communities, but also a call to reflect on and be mindful of its inherent responsibilities. Silton was also commissioned to produce a set of postcards to accompany both installations; each postcard corresponds to one of the project’s utilized quotes.